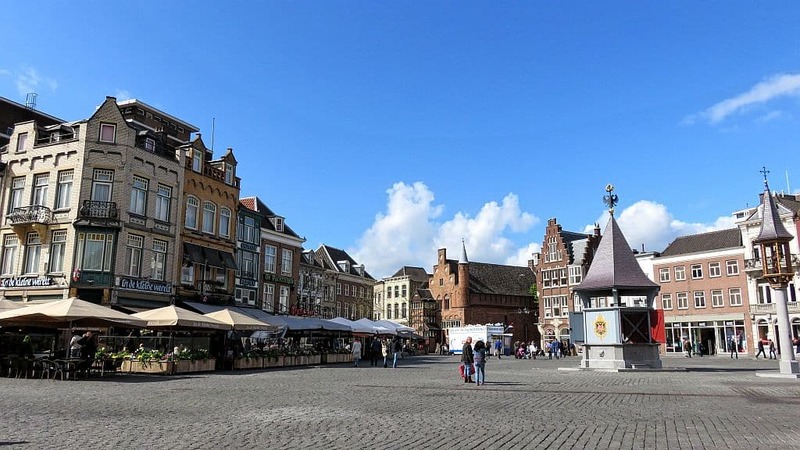 If somebody asks me which is my favourite city in the Netherlands, and believe me I have been to many of them as I live there, I will answer without any doubt – it is Den Bosch! What makes Den Bosch so special and why you should visit it? Find out here in this city guide. ‘s-Hertogenbosch (don’t even try to pronounce the name, better use the shortened version – Den Bosch), is a laid-back historical city in the south of the Netherlands, a capital of the province of North Brabant (Noord Brabant), famous for the joie de vivre, hospitality, carnival and good food. The city was founded by Duke Henry I of Brabant and in 1185 he granted the settlement city rights and trade privileges. The name of ‘s-Hertogenbosch translated from the Dutch language means “the Forest of the Duke”. In the 16th century the city was the second biggest on the territory of today’s Netherlands after Utrecht. During the Eighty Years’ War the city was besieged a few times as it fought on the side of the Catholics. Luckily enough the city was spared during the WW2 and was not destroyed by bombardments. Den Bosch is easily accessible from Amsterdam or from any place in general in the Netherlands. The best way to travel to Den Bosch is by train. The city has good connections with Amsterdam and other major Dutch cities. It takes only 1 hour from the Central Train Station in Amsterdam to Den Bosch, thus making Den Bosch a perfect destination for a one-day trip from Amsterdam. You can plan your trip to Den Bosch by clicking on the Plan my journey button bellow. However, if you have rented a car for your stay in the Netherlands, you can head to Den Bosch hitting A2, just remember no matter how good the Dutch highway system is, traffic jams are a daily occurrence on the Dutch highways. A2 is particularly busy, although if you travel from Amsterdam to Den Bosch in the morning you will be travelling in the “right” direction for traffic jams, which means that they will be less severe than if you were traveling the opposite direction. When you arrive by car in Den Bosch, I will advise you to use one of the 3 parking terrains just outside the city centre, where you can park for free and then you can take the bus to the city centre. In 2018 the ticket costs only 4 EUR and up to four people can travel on one fare. If you decide to park in the city, but please, think of pollution and traffic in this historical place, you can do so in one of the many parking garages, or you can park alternatively on the street. The historical centre of Den Bosch is pretty compact and the city is absolutely walkable. I would recommend you just to take your time and walk around. This is the best way to immerse yourself in the atmosphere of the city. All sights and museums are indicated on the map below. St. John’s Cathedral (Sint-Janskathedraal), or simply Sint-Jan, the way it is locally called, is a fine example of the Gothic Architecture. The construction of the church began in 1220 and was finished in 1530. Initially, the church was built outside of the city walls. It was only in 1559 when the church became a cathedral and a seat of the bishopric of ‘s-Hertogenbosch. In 1566 during the so called Iconoclastic Fury (Beeldenstorm) a lot of the interior decorations were destroyed or removed by the mobs formed by Calvinist Protestants. In 1629 the Sint-Jan became a Protestant church. It was returned to the Roman Catholics in 1810 by Napoleon. The cathedral went through many restorations, the last one just finished recently in 2012. The cathedral is still operating, so it’s open to visit outside of the mass hours. A unique detail about the cathedral are the 96 statues on the flying buttresses. There are 16 flying buttresses with 6 statues sitting on each buttress. They portray different professions, animals and mythical figures. In 2016 when Den Bosch was commemorating 500 years from the death of Hieronymus Bosch (the most important Medieval painter in the Netherlands), I was able to climb the roof gutters of the cathedral and see those figures from a close distance. It was an amazing experience, a part of “The Wondrous Climb” (De Wonderlijke Klim). I hope this will not be a one-off event, and the city will renew it at one point, allowing more people to see this magical side of the cathedral. I must admit, this was one of the most amazing tours I have ever done. You can also climb the 43-m high tower of the Cathedral. A view from the roof of the Saint John's Cathedral. At the distance you can see the highest residential building in Den Bosch - the Jheronimus - 24 stories, 75 m.
It was an unforgettable experience walking on the roof of the St. John's Cathedral. The small statues looked so full of life! There are 96 of these unusual statues sitting on the flying buttresses of the St. John's Cathedral. They say they were inspired by Hieronymus Bosch and his fantastic world. The city hall in Den Bosch is a marvelous building that dominates the Market Square. It was built in the 13th century and completely renovated in 17th century. The old council chamber is decorated with impressive tapestry. If you happen to say the “yes” word in this lovely baroque building, you will do this in style, as the walls of the wedding hall are luxuriously decorated with golden leather. You can visit the city hall as a part of the walking tour of Den Bosch. The City Hall actually consists of three houses that were put up together as one building in the 17th century. The middle part is the oldest of the three. It has been serving as a city hall since 1366. The amazing interior decorations in the City Hall of Den Bosch. Another fine example of the wall decorations in the City Hall in Den Bosch. And this is all made of leather! A detail of the golden leather wall decoration in the wedding hall of the City Hall in Den Bosch. This reddish brick building with a turret at one end of the Market Square is one of the oldest preserved brick buildings in the Netherlands. It was built in the first half of the 13th century and is a typical example of a hall house. Through the centuries De Moriaan served various purposes: from a place for services of the Lutheran community in the 17th c. to a theatre in the 18th century. Today it houses the City’s Tourist Office. The building was completely restored between 1963 and 1967. If you come by train to Den Bosch, you cannot miss the Dragon Fountain. When you get out of the train station and head to the city centre, you will pass by this impressive fountain with a golden dragon on top. The fountain was built in 1903 and has a bit of a sad story behind. When the provincial governor P.J. Bosch van Drakestein died in 1894, he left the municipality of Den Bosch 10 000 Dutch guilders and requested the money to be used for the building of a fountain as a memorial for his deceased twin daughters (aged 16) and wife. The dragon on the top of the column is completely plated in gold. If you ask yourself, why exactly they chose a dragon for this fountain, well, the name (Drakestein) of the governor translates from Dutch (“draak”) as “a dragon”. The city walls of Den Bosch are quite well preserved and restored together with some of the bastions and city gates. The first city walls were built between 1220 and 1250 around the today’s Market Square. The settlement grew rapidly and in the 14th century the city walls were drastically expanded. In the following centuries the city walls were turned into fortifications and Den Bosch became a medieval stronghold surviving a few sieges. At the end of the 19th centuries a great part of the fortifications was demolished to give way to the expansion of the city. However, the walls had remained almost intact. You can book one via the website of DagjeDenBosch.com or with the City’s Tourist Office. The Market Square in Den Bosch is a busy place - surrounded by shops and restaurants, it is a preferred meeting point and a nice place to just hang out. If you are a museum lover and you have already done the walking tour, then head to the Museum Quarter, where you can visit the two biggest museums in Den Bosch. The Noordbrabants Museum has a collection that focuses on the history and art of the Dutch province of North Brabant. From the 30 000 objects only 15% are exhibited in the museum. Read more: Everything you need to know about Noordbrabants Museum: how to get there, what you can see, what the current exhibitions are. If you are into modern art and design, then you would love to visit the Design Museum Den Bosch (former Stedelijk Museum). The two museums (Noordbrabants and Design Museum) are connected. You can also buy a combined ticket for both museums and then the price is only 15 EUR. Read more: Complete guide about the Design Museum Den Bosch: how to get there, what you can see, what the current exhibitions are. The Jheronimus Bosch Art Centre is dedicated to the greatest medieval painter Hieronymus Bosch (1450 – 1516), famous for the fantastic figures and detailed landscapes. The Centre has in its collection all works of the artist in full-size reproductions. As the Centre is hosted in a former church, you can climb the 40-m high tower and admire the city from a bird view. The spirit of Hieronymus Bosch can be sensed anywhere in his home town. The celebrations in 2016 left a lot of artwork on the streets and there are all those little surprises everywhere in the city: graffiti, fantastic figures at unexpected places. Keep your eyes open when walking around in Den Bosch and you will be rewarded! One of the best ways to see Den Bosch and explore its hidden treasures is with a boat tour on the Binnendieze. You will be able to go under the houses and reach places which you won’t be able to see otherwise. The river Binnendieze used to be the city’s sewer in the past. There are different routes of the boat tour and tickets can be booked via the Kring Vrienden van ‘s-Hertogenbosch. The service operates only in April – October. If you take one of the side alleys you will find yourself in an absolutely idyllic place - quiet, quirky and laid-back. A street away is the busy Saturday market on the Square, unbelievable, isn't it? A view on the Dommel River. You can also take a boat trip on the Dommel. There are service that run all year around with a saloon boat. Shopping in Den Bosch is a must-do. There are a lot of lovely independent shops, as well as department stores. On Thursdays the shops are open till late in the evening (21:00) and on Saturdays there is a big market taking place on the Market Square. On Fridays there is a special farmers’ market with organic produce. There is this expression in the Dutch language “Burgundian lifestyle”, which means joie de vivre combined with good food and wine. It is usually attributed to the lifestyle in the province of North Brabant, as compared to the northern provinces. And Den Bosch, being the capital of North Brabant, won’t disappoint you on the culinary front. It’s bustling with great places to eat: from cozy cafés to fancy restaurants and international cuisine – Den Bosch has it all! The most restaurants and cafés are located on the streets the Korte Putstraat, the Uilenburg and the Parade. When visiting Den Bosch, there is one thing that you absolutely need to try. It is like visiting Paris and seeing the Eiffel Tower, but tastier – the Bossche Bol – a gigantic profiterole covered with dark chocolate and filled with whipped cream. Disclaimer: If you book accommodation via the above link, I may earn a small amount at no extra cost for you. This helps me run the blog and pays for costs like the the web-hosting, for example. You can choose to visit Den Bosch on a day trip, but if you want to stay longer, there are a plenty of things to do and see. There are a lot of festivals organized in the city, so on the cultural side you won’t be disappointed either. If you plan to stay about a week or even more, then I can recommend you visiting a few places in the neighborhood: Heusden – a small fortified town, easily accessible by bus, or the natural reserve – De Biesbosch. If you are a nature lover, you can also spend half a day hiking in the nearby sand dunes at Dunes of Loon and Drunen National Park. Are you staying in Den Bosch in the spring, then Keukenhof might be a good idea. It takes about hour and a half by car to the famous tulip gardens in Lisse. Just pay attention that Keukenhof is not an all-year-around attraction, it will be open in 2018 from 22 March till 13 May. It you love amusement parks, the Efteling theme park is really close to Den Bosch and you can visit it on a day trip. Thank you, for this tip!
! This looks amazing! I did the same thing when I traveled to Netherlands. I was based The hauge and took day trips to different little towns. I missed this one..oh well Im just going to have to come back! lol because this looks beautiful! I wish I’d read this before I went to Amsterdam! This city looks so cool. And St John’s Cathedral is gorgeous! I guess there’s always next time! You never know. The Netherlands is so beautiful, that it deserves a second chance! Oh my goodness, I love the architecture and look of the city. And I’m a total history nerd, and love the background you give. We’ve been saying Amsterdam has to happen for a while, and i love this as a side-trip idea! Looks like an amazing city! Should have known about it while I was roadtripping through the Netherlands in May this year. Your photos are stunning! Oh well, there’s always a next time. It makes me so sad when you realize you can’t visit all lovely places in a given country! But as you said, there is always a second time. I I love your beautiful images of the city! Day tours are one of my favourite things to do when visiting a country. I’m happy for this info. Oh Giethorn is an absolute gem, too! Great read. Heading to Amsterdam in May so will keep this post in mind when planning our trip! Have a great time in Amsterdam and just keep in mind there’s so much beyond Amsterdam in the Netherlands! Thanks for the tip! I keep seeing cheap flights to Amsterdam so we might be going soon! You can also fly to Eindhoven instead of Amsterdam. I am not sure where you live, but if you live in Europe there are great flight deals to Eindhoven as well. This city looks very interesting! I am always amazed by the way Dutch cities have this chill vibe, how you feel you could totally have a laid back life there. Amsterdam is more chaotic (but still I found it a more pleasant chaos than Rome) but Ivisited Nijmegen and I was really surprised by the peaceful and happy atmosphere. I get the same vibes about Den Bosch, and would love to experience it and see if I’d get the same feeling I had in Nijmegen. It really feels like a place with really good quality of life. Yes, there are no crowds running from one place with the other consuming the place with their cameras. This is also why I love the Dutch cities! This looks like such a beautiful city. The architecture of the city hall reminds me so much of Munich. Thank you for sharing and exposing me to a new city!